From Ibn Al-Haytam’s optical lenses and Ibn Hayyan’s chemistry flasks to a mosque lamp of Amir Qawsun, Muslim Civilisation played a major role in inspiring the growth of glass industry from the 8th century onwards. 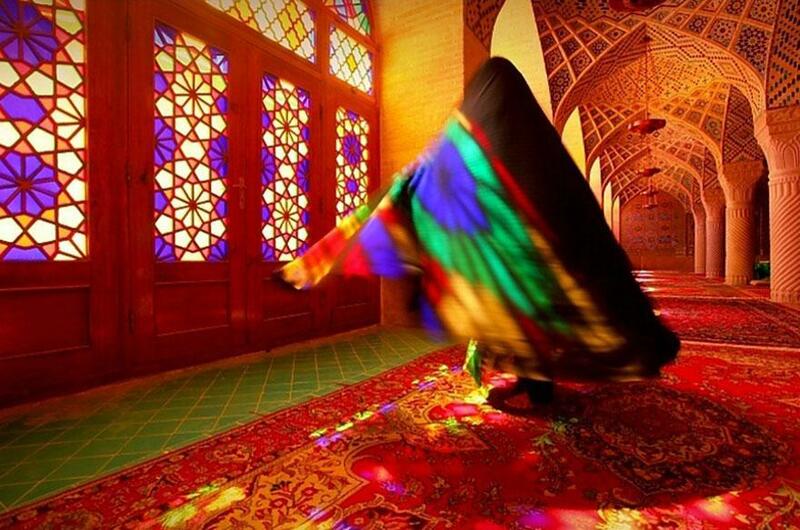 Mosques, houses and cities were transformed into beautiful spaces richly decorated with glass. Beauty and functionality were both essential elements of design in Muslim Civilisation. Possibly in an effort to supply the thousands of mosques, and also thanks to the input provided by the thriving scientific activity in fields such as optics and chemistry, glassmakers in Muslim Civilisation turned - what had up till then been - a craft into an industry employing new techniques and large number of workers from different parts of the Muslim Civilisation. Under Islam, the glass industry witnessed a revival. The old centres flourished and new ones were established. The remarkable, sumptuous Islamic glass treasures which are distributed among museums throughout the world, bear witness to the high artistic and technological level of Islamic glass." *Al-Hassan, A. Y. “Science and Technology in Islam: Technology and applied sciences” UNESCO, 2001; Page 74. "... Similar bottles are in museums in Saint Petersburg, Kiev, and Berlin. That a majority of these examples were reportedly found in the Caucasus region or along the coast of the Black Sea suggests that they were part of the well-established glass trade between Syria, northwestern Asia, and eastern Europe"
Throughout the Muslim Civilisation glassware was produced in vast amounts from the 8th century either by blowing liquid glass into holds or by cutting it from crystal. Glassmakers in Syria and Egypt inherited the Roman glass industry and improved it by developing their own technique perfecting glass decoration and colouring, and expanding the variety of products. 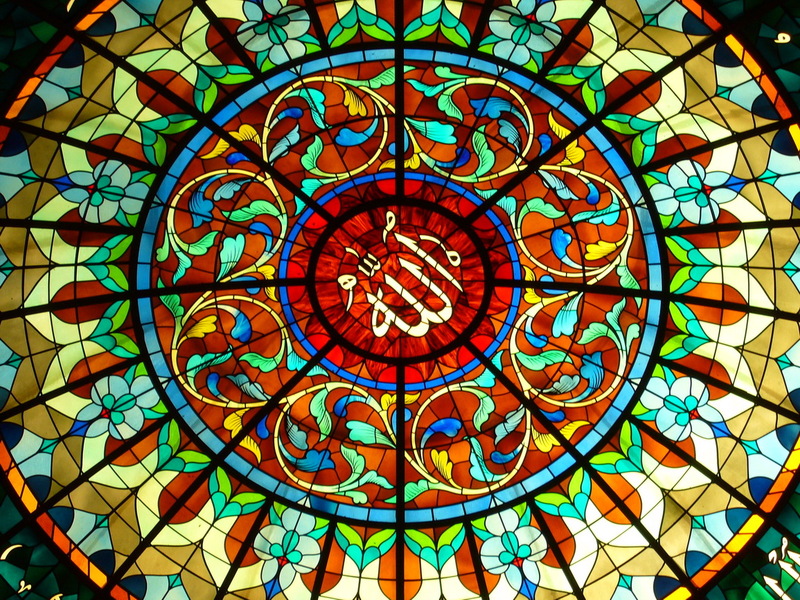 Muslim and non-Muslim glassmakers working in the Islamic areas, however, were extraordinarily creative and, in tune with the general evolution of Islamic art, brought this craft to a new technical, technological, and artistic heights." *Meri, J. W. “Medieval Islamic Civilization: An Encyclopedia”; Routledge, 31 Oct 2005; Page 297. Excavation work in Syria and other parts of the Muslim Civilisation uncovered a huge amount of glassware. Aleppo in Syria was mentioned as a glassmaking and decorating centre by the geographers Yaqut Al-Hamwi (d. 1229) and Al-Qazwini (d. 1283). Damascus, too, was described as a glassmaking centre by Ibn Battuta (d. 1377). Egypt, Iraq and Andalusia were also all producing glass in vast quantities. Glass from the Muslim Civilisation, and especially that from Syria, was highly prized the world over. Glass objects were discovered in medieval European sites in Sweden, and Souther Russia. Even such fragile objects as Syrian enamelled glass of the 13th century have been found in Sweden. 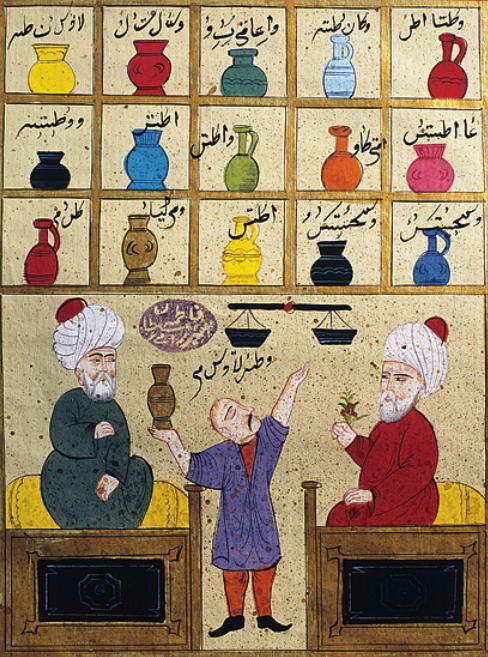 Modern chemistry grew, in some measure, out of Islamic alchemy…. There was a great deal of practical experimenting done in the making of glass, leather, and cloth, the working of metals, and in the preparation of drugs..."
*F.B. Artz: The Mind; op cit; pp. 165-7. 5.1 Glass chemical flasks, Arabic manuscript held in the British Library showing the distillation process in a treatise of chemistry. © The British Library, London. ... were refracted upon entering his glass sphere, underwent a total internal reflection at the back surface of the glass sphere (which sent them back toward the observer), and experienced a second refraction as they exited the sphere. This occurred in each droplet within a mist to produce a rainbow." "the makers of such objects may have been seeking ways to achieve some freedom of expression within the rules of repetition common in Islamic art. This freedom could be achieved by using different combinations of tongs, which bore patterns different from those of one- or two-part molds. Archeological finds indicate that this type of glass was traded extensively in the Islamic world during the ninth and 10th centuries." Al-Jazari's treatise includes water and irrigation devices, machines where robot girls place a drinking glass in the ruler's hand, mechanical flutes, decorative items such as a monumental door with one of the earliest descriptions of green-sand casting." *Al-Djazairi, S.E.. The Golden Age and Decline of Islamic Civilisation, Volume 2 (Kindle Locations 2759-2760). MSBN Books. Kindle Edition. The technique of cutting crystal was said to have been introduced by ‘Abbas ibn Firnas (d. 887), scholar and inventor in the courts of ‘Abd al-Raḥman II and Muḥammad I. It is worth pointing here to the genius of Ibn Firnas, who was not only able to decipher the most complex writing, but also made attempts at flying by building artificial wings. In relation to glass, he was familiar with the scientific properties of glass, and contributed to the early experiment with lenses and the idea of magnifying script by their use. 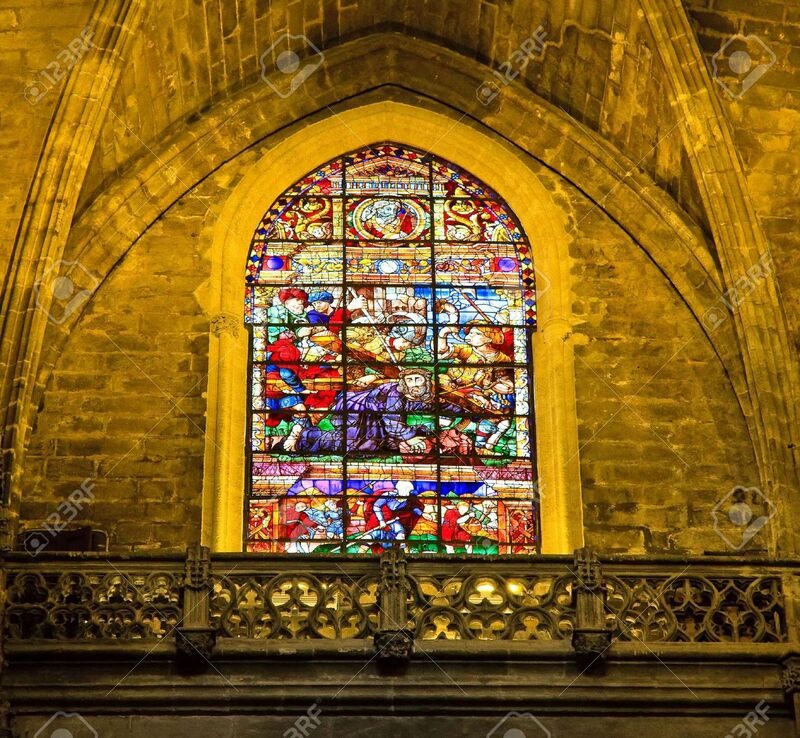 He also lent his skills to the glass making furnaces of Cordoba, and made a representation of the sky in glass, which he was able at will to make clear or cloudy, with lightning and the noise of thunder at the press of a finger. 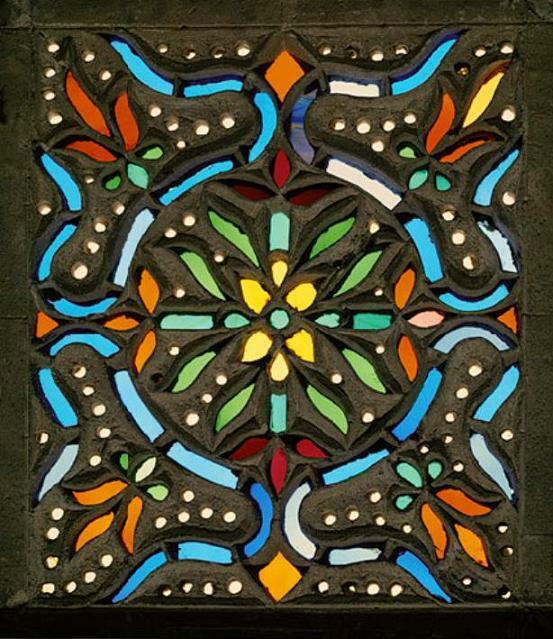 9.1 Window in stained glass, 17th century, Egypt or Syria (Ottoman period?) (38.7 x 48.3 cm). A window such as this with brightly coloured panes in blue, orange, green, and red might have been found in a room of an aristocratic home in the Islamic world. Tinted glass was favoured because it filtered the light, but it also complemented the multihued furnishings of the room. German art historian Otto von Simson explained the origin of the rose window by comparing the idea to the six-sided rosettes and octagon window on the outside wall of the Umayyad palace Khirbat al-Mafjar, built in the Holy Land in about 750 CE. The theory is that Crusaders saw such windows and brought the idea back to Europe, introducing it into churches." "... Large glass lamps of this type were commissioned by sultans and members of their court for mosques, madrasas (Qur'anic schools), tombs, hospices, and other public buildings in fourteenth-century Mamluk Cairo. This example bears the name of its patron, Qawsun (d. 1342), amir of the Sultan al-Nasir Muhammad ibn Qalaun (r. 1293–1341 with brief interruptions), and was probably intended for one of his two architectural commissions in Cairo—a mosque or a tomb-hospice complex." ... The first painters of glass in the Islamic world applied a brownish or yellowish metallic pigment on bowls, dishes, and other objects. The decoration usually consists of animal or vegetal motifs, sometimes accompanied by inscriptions. By applying pigments to both sides of these objects, glassmakers could highlight details or exploit the transparency of the glass to produce subtle shading effects..."
Some of the most sophisticated Egyptian glass vessels were decorated with lustre. This shiny, sometimes metallic effect was achieved by painting copper or silver oxide on the surface of the object, which was then fired at a temperature of about 600°C (1112°F) in reducing conditions. The same technique, as already noted, was used in the decoration of earthenware, not only in Egypt but also in Iraq and Iran. Until recently, controversy raged over the origin of lustre painting, but the problem appears to have been solved by the discovery at Al-Fustat, of a glass cup of local type, inscribed with the name of ‘Abd al-Hamad, governor of Egypt in 771-772; Egyptian glass painters were therefore using lustre some time before its appearance in Iraq. "... Its decoration is probably inspired by contemporary manuscript paintings and depicts courtly figures and scenes of royal pastimes, such as hunting and polo." 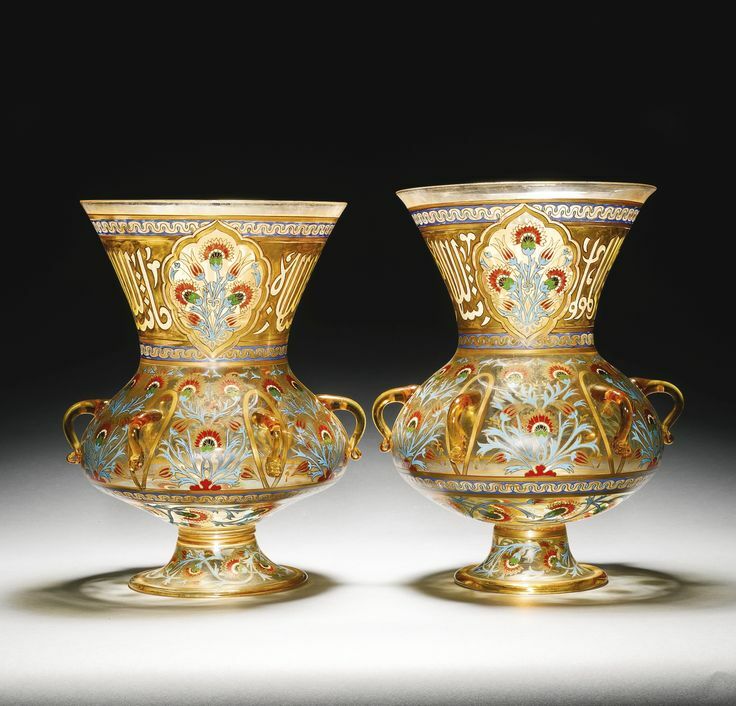 Contact between the Byzantine Empire and the new empire of Islam allowed Islamic glassmakers to add the known Roman and Byzantine glassmaking techniques to their own glassmaking knowledge. 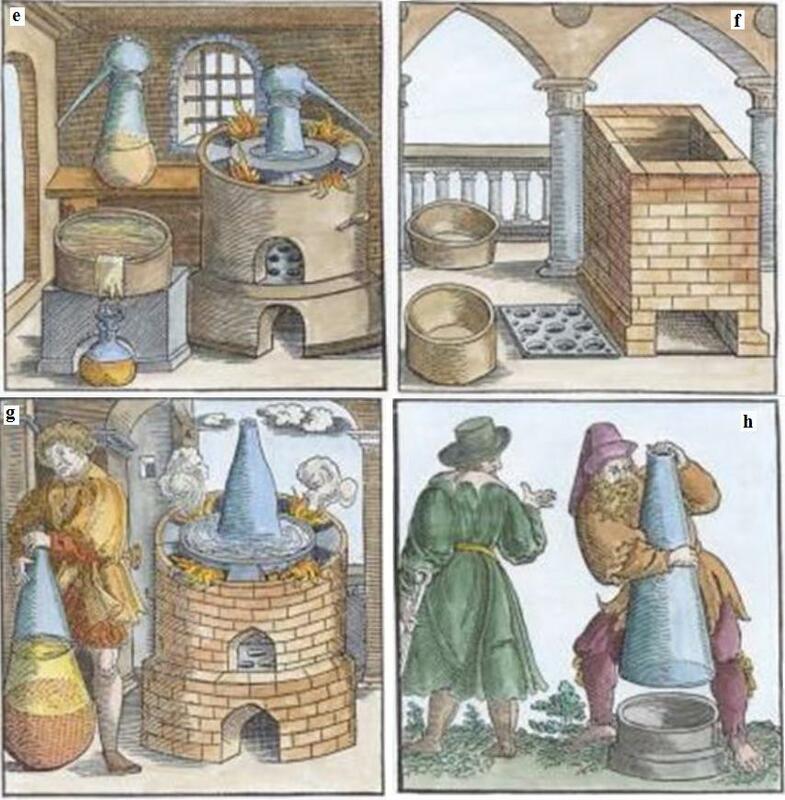 As with many chemical arts, this cumulative glassmaking knowledge was then preserved by the world of Islam until the coming of the Renaissance in the West. In Islam glassmaking flowered again for a time, combining Roman knowledge with indigenous traditions..."
In Al-Andalus, glass vessels were blown in Almeria, Malaga, and Murcia in imitation of eastern wares, such as the irakes –glass goblets– so favoured on the noble tables of 10th-century León. The technique of cutting crystal was said to have been introduced by ‘Abbas ibn Firnas (d. 887), scholar and inventor in the courts of ‘Abd al-Raḥman II and Muḥammad I. 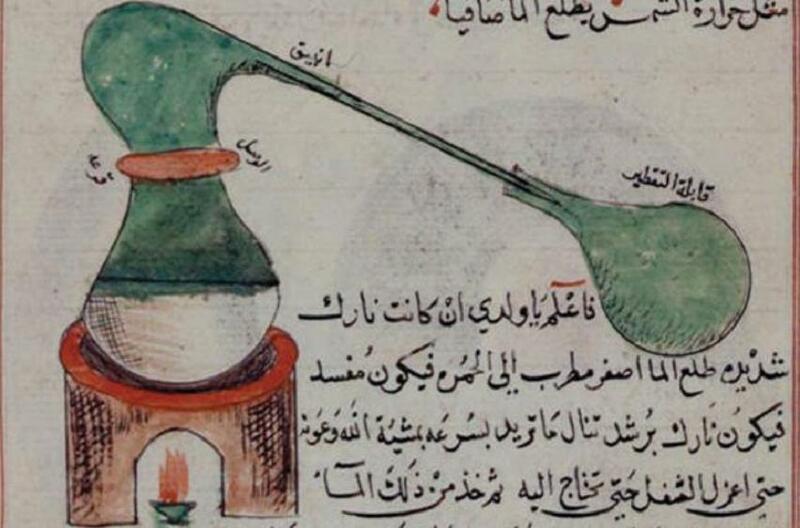 It is worth pointing here to the genius of Ibn Firnas, who was not only able to decipher the most complex writing, but also made attempts at flying by building artificial wings. In relation to glass, he was familiar with the scientific properties of glass, and contributed to the early experiment with lenses and the idea of magnifying script by their use. He also lent his skills to the glass making furnaces of Cordova, and made a representation of the sky in glass, which he was able at will to make clear or cloudy, with lightning and the noise of thunder at the press of a finger. Will not respond unless drawn upon. Thus one can learn refinement from its manners. *Ihsa’ al-Ulum; ed. O. Amin; Al-Maktaaba al-Anglo-Misriya (Cairo; 1968), pp. 108-110; in G. Saliba: The Function of Mechanical Devices in Medieval Islamic Society; in Science and Technology in Medieval Society; edited by P.O. Long; The Annals of the New York Academy of Sciences (New York; 1985), pp. 141-51; at pp. 145-6. Al-Djazairi, S.E.. The Golden Age and Decline of Islamic Civilisation, Volume 1, MSBN Books. "In the ninth and 10th centuries, Islamic glassmakers introduced new shapes, colors, and decorative patterns. This is among the most extraordinary stained glass objects that have survived from the Islamic period..."
"... Also the thinness and translucence of Syrian glass are proverbially famous; one says more delicate than Syrian glass, or clearer than Syrian glass." *H.J. Cohen: Early Islamic Scholars as glassmakers; in A. Engle ed: Readings in Glass History; 2; (Phoenix Publications; 1973); pp. 30-5; at p. 33. 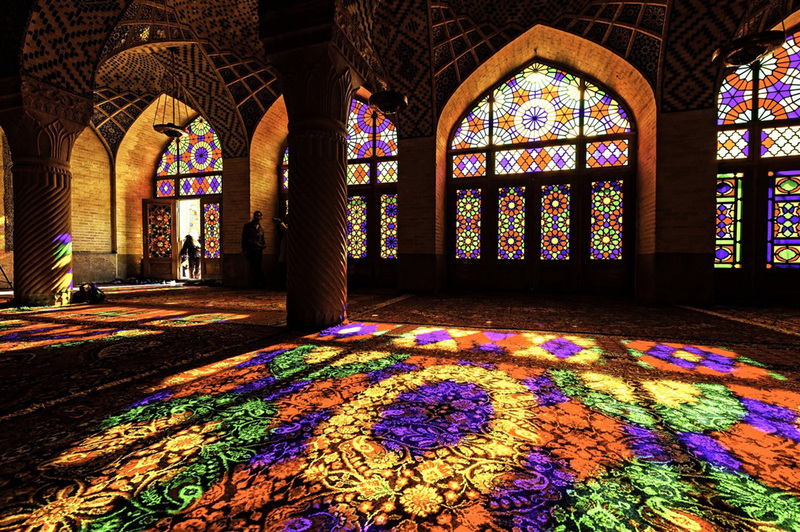 "The designers Muhammad Hasan-e-Memar and Muhammad Reza Kashi Paz-e-Shirazi used extensively stained glass on the façade and other traditional elements such as panj kāseh-i (five concaves), which create a breath taking effect of the interior like standing in a kaleidoscope. Once the sunlight hits the stained glass, the entire building is flooded by a vibrant rainbow of colours. In popular culture, the mosque is also called Pink Mosque, because its tiles are beautifully decorated with a pre-eminently pinkish rose colour." "... Egyptian and Syrian glass and metal-work, as well as many of the products of Mesopotamia and Moorish Spain, were highly prized as being manifestly superior to anything that could be made in western Europe. It was largely by imitation and, in the end, sometimes by improvement of the techniques and models that had come from or through the Near East, that the products of the West ultimately rose to excellence..."
*C. Singer et al edition: A History of Technology; vol II; op cit. pp. 754-6. "Ibn al-Haytham’s treatise On the Burning Glass exhibits ‘a profound and accurate conception of the nature of focussing, magnifying, and inversion of the image, and of formation of rings and colours by experiments.’ In his treatise ‘The Shape of the Eclypse,’ he tries to explain the crescent image cast by the partially eclipsed sun through a small round aperture. Ibn al-Haytham also wrote on the rainbow, the halo, and spherical and parabolic mirrors, and fixed the height of the atmosphere at the equivalent of about ten English miles." *Al-Djazairi, S.E. The Golden Age and Decline of Islamic Civilisation, Volume 2 (Kindle Locations 6559-6564). MSBN Books. Kindle Edition. "Abu al-Qasim al-Zahrawi (Abulcasis in Latin), a 10th-century surgeon in Córdoba, composed Al-Tasrif, a 30-chapter medical encyclopedia describing dozens of operations, complete with graphic illustrations of surgical instruments, including scalpels, cauterizing tools, feeding tubes and cupping glasses." "Eighth century treatise on glass: Kitab al-Durra al-Maknuna (The Book of the Hidden Pearl of Jabir ibn Hayyan (Geber in Latin) (c. 721–c. 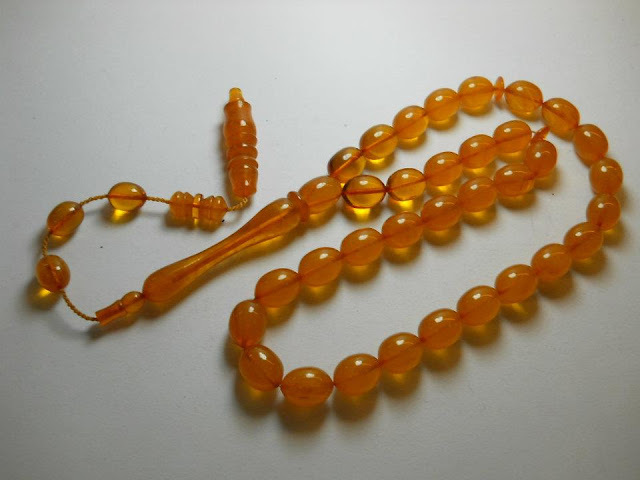 815) On Coloured Glass, On Lustre, On Gemstones And Pearls: Part 1: The Manufacture of Coloured Glass; Part 2: Lustre Glass; Part 3: The Colouring Of Gemstones, The Purifying and Making of Pearls and Other Useful Recipes; Part 4: Assessment of Kitab al-Durra al-Maknuna." "Al-Tusi made his observations without telescopes or even glasses," says Djebbar, removing his own spectacles and waving them theatrically in the air. "Even though the Arabs possessed the knowledge to make lenses, they probably thought it was an idiotic idea. God made us like this; why hang something on our noses to see better?" he jokes, placing his glasses back on his nose with a flourish. His audience erupts into laughter as Djebbar, who was curator of "The Golden Age of Arabic Sciences"—the Paris exhibition, which ran from October 2005 through March 2006 at the Arab World Institute—tries to quiet them down." "... Of these are several small military departments… such as the department of foundries for iron, copper, glass and others." *Al-Qalqashandi: Subhi al-A’sha; Cairo Ministry of Culture; part 4; p. 188. "Al-Qalqashandi (d. 1418) in Subhi al-A’sha, when discussing government departments in Damascus during the period of 1171-1250".